See also Wonky Pins Europe1 by Aeolien. Info: Created on 31st March 2015 . Last edited on 27th April 2015. Congratulations! FontStruct Staff have deemed your FontStruction worthy of special mention. 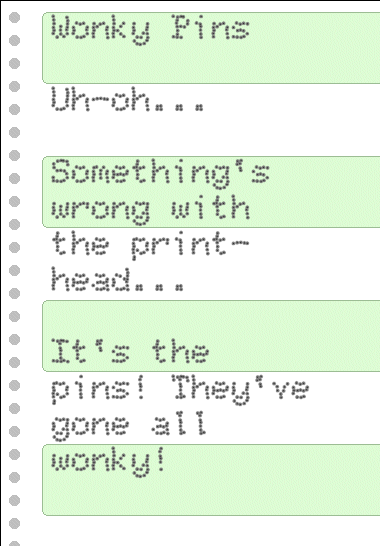 “Wonky Pins” is now a Top Pick. @meek - Rob, as always, I am humbled and appreciative of this recognition, as well as deeply honored. Thank you. @Aeolien - ...and thank you for your kind words! Another great work. Yes, the text looks definitely more natural than the one with perfectly aligned dots. It's amazing how much thought you've put in to achieve the effect. It is very difficult, might I say, nearly impossible to generate true randomness. Furthermore, I reckon, the imperfections generated by a faulty printhead are nonrandom, but chaotic. Unlike random noise, chaos has structure with built-in self-similarity. I recently read the problem these music subscription services face regarding randomizing. They say that when something is truly random, it is completely conceivable that five songs from a singly artist play in the same order as in the album, each randomly selected. Of course, when this happens it seems to the listeners as non-random. To counter, they have to create complicated algorithms to randomize in a manner that also appears random, which essentially means not actually random. Since dot matrix, by creating a matrix of dots and then nudging them out and then extracting the letters out of the matrix, you did an amazing work of creating consistent inconsistency. Excellent. I'm with the guys, great font! 10/10. @Frodo7: Thank you for the kind words! @Thalamic: Thank you for the kind words! @Elmoyenique: Thank you for the kind words! I appreciate your support.